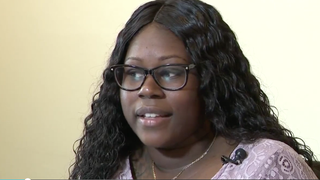 Tiesha Davis, a South Florida mother of three, says she’s being kicked out of her apartment because she didn’t give her landlord an ultrasound of her pregnancy. A single working mother of three is taking on a Florida housing complex after a property manager refused to renew her lease because she hadn’t given her landlord an ultrasound of the child she was carrying. As the Miami Herald reports, Tiesha Davis signed a rental agreement with Sorrento Rental Community in Miramar in September 2017. At the time, Davis was four months pregnant, a fact that was clearly visible to Assistant Property Manager Jose Galindo, according to Davis’ lawsuit. “During such time Ms. Davis was noticeably pregnant, to the extent that Mr. Galindo insisted that she sit in the front seat of the golf cart when he was driving her through the property,” the complaint reads. But Galindo refused to renew Davis’ 12-month lease in January, when Davis was eight months pregnant, after finding baby goods in her closet during a routine inspection of the apartment. Galindo asked Davis if she was pregnant, then told her that she should have let the property know she was pregnant in her application. According to the suit, Galindo told the 26-year-old that she was required to show him both a letter from her doctor and an ultrasound at the time of her tenancy. Davis insists that she never hid her pregnancy, and she filed a lawsuit last month against the housing complex. Her co-plaintiffs include Housing Opportunities Project for Excellence, a Florida nonprofit that fights against housing discrimination, and Akia Wiggins-Shabazz, a tester for HOPE who says she was told by a Sorrento leasing agent that she couldn’t rent an apartment unless she provided an ultrasound of her baby in March. As the Herald notes, HOPE sent two testers posing as pregnant would-be lessees to one of Sorrento’s sister properties, Monterra, in December of last year. One tester was a white Hispanic woman; the other, a black woman. According to the suit, both pregnant women were told that there were no units available but were given a list of requirements to qualify as renters; these included disclosing how many people would live in the apartment unit, child-support information, proof of income, a driver’s license and a Social Security card. But the black applicant also was asked about her arrest history. Additionally, an agent outlined for her possible situations in which she could lose her tenancy, including being a current homeowner and having a history of foreclosures, short sales or evictions, according to the suit. That wasn’t true of the white Hispanic applicant, who wasn’t asked about her criminal record or given such a talk. Neither woman was told anything about proof of pregnancy or submitting documents concerning their unborn children, reads the suit, which concludes that Sorrento “intentionally or recklessly” violated Davis’ and Wiggins-Shabazz’s civil rights. As of last month, Davis was still searching for a new place for her and her family to live. She also pointed out that the Sorrento property received public funding.